After years of moving around the world with her family, Henrietta Alsdorf and her husband Howard ended up settling here on Bainbridge Island. 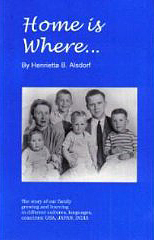 In 1995 Alsdorf published her family's story in her book Home is Where... . The book takes the reader on a tour of Alsdorf's life, from her childhood in southern Indiana, to Oberlin and Yale, her honeymoon in China, setting up her first home in Kobe just 14 months before Pearl Harbor, and bouts with tropical disease in India. Home is Where... is a warm story of a family's trials and triumphs, set against the larger historic context of its time - World War II, racial injustice, and India's struggle for independence. Throughout the book, Alsdorf makes one thing clear: to achieve justice and peace in our own homes or in the world at large it is imperative to communicate with love. Henrietta Alsdorf passed away in April 2008 after a long and fulfilling life.